Thursday, Oct 4, 2018, 4:30 – 6:30 p.m. 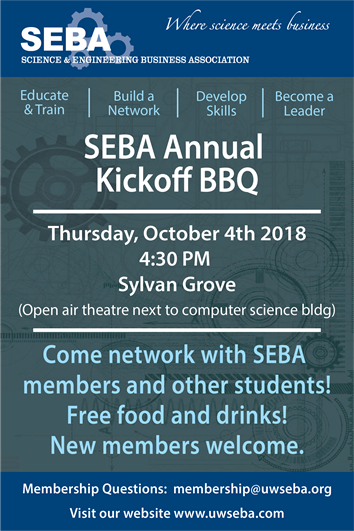 The Science and Engineering Business Association invites you to their Annual Kickoff BBQ on Thursday, October 4th at 4:30PM at the Sylvan Grove theater! If you would like to volunteer to help out at the BBQ please sign up here: volunteer sign-up. This counts towards one of the SEBA membership requirements!